Ron’s Auto Service provides comprehensive auto repair and maintenance services for all makes and models of vehicles from new. Our technicians assess the condition of your vehicle’s systems and parts and let you know what work needs to be done immediately and what work can wait for another day. Warranty work can be done at your dealership. 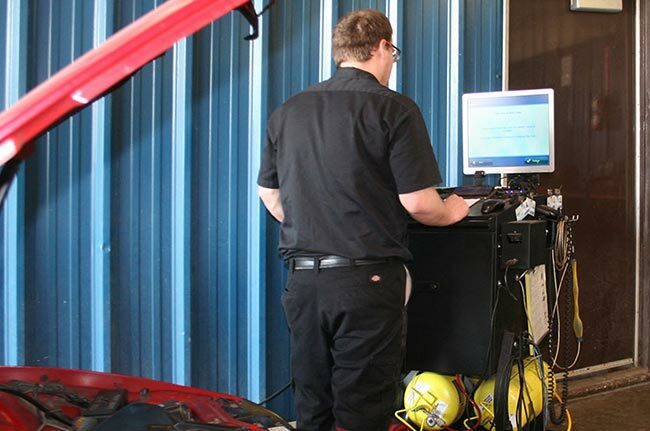 The 4000 square-foot shop with 5 bays is equipped with the most up-to-date diagnostic equipment so the service technicians can give you an accurate assessment of the service your vehicle needs. If your vehicle needs to stay for an extended period of time, rest assured it’s safe and sound in the 5000 square-foot fenced-in compound. If you let go of the steering wheel for a quick moment and the car veers off to either side, get Ron’s Auto to check out your vehicle’s alignment. It’s so important to maintain alignment in order to reduce wear and tear on your tires and other mechanical moving parts. Before summer weather finally kicks in, Ron’s Auto Service will check out your system thoroughly. Regular maintenance checkups include a brake inspection to ensure they function at optimum performance to keep all of road trips safe. To keep your vehicle riding smoothly, our technicians examine the condition of the struts and shocks. Regular inspection and maintenance decreases the wear andtear on your tires too. Enjoying the luxury of a quiet ride is appreciated by all. Your muffler and exhaust system provides much more than that. It increases the efficiency of your engine and minimizes fuel consumption. Ron’s Auto Service technicians will take a closer look at this critical system to determine if and when it will need to be serviced. No one wants to be stranded on the side of the road with their vehicle blowing off steam. The engine’s cooling system needs to be properly maintained on a regular basis to prevent the engine from overheating or possibly seizing up. Technicians will inspect the cooling system to troubleshoot any potential problems before they actually happen. If life is a highway, it’s better travelled with tires that stand up to our Canadian seasons, commuting to work or transporting the family here and there. Knowledgeable suggestions are provided with up to date technological information by the experienced team at Ron’s Auto Service to make your life easier when it comes to making decisions about the safest and most economical choices for your vehicle’s tires. Ron’s Auto Service will arrange transportation to your home or office while your vehicle is being serviced.